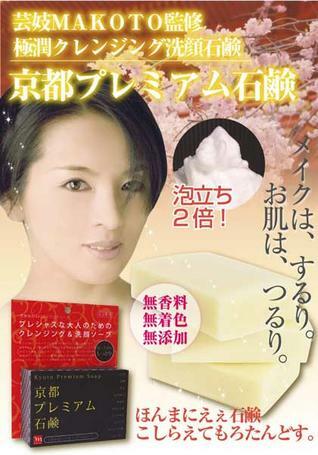 Kyoto premium soap silk and pearl extract ผิวหน้า ผิวกายขาว เนียน ด้วย สารสกัดจากไหม น้ำนมถั่วเหลือง และไข่มุก จากญี่ปุ่น มาแระจร้า 120 g.
ข้อมูลสินค้า - Kyoto premium soap silk and pearl extract ผิวหน้า ผิวกายขาว เนียน ด้วย สารสกัดจากไหม น้ำนมถั่วเหลือง และไข่มุก จากญี่ปุ่น มาแระจร้า 120 g.
Instructions for use I roll with both hands and lather like soap. Please be gentle facial cleansing foam was able to put on the face and body. 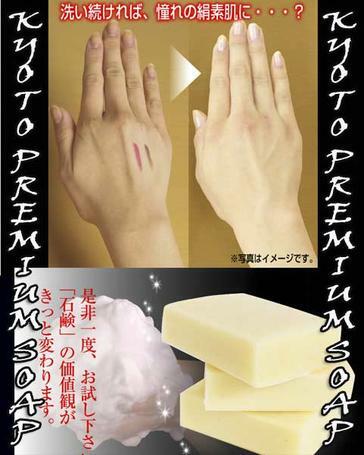 PRECAUTIONS ● Due to the nature of this product, or if there is blowing white powder on the surface of the soap, the soap can cause cracking, there is no problem on the quality and use. ● Please do not use it when there is a staff skin disorders such as eczema, skin inflammation staff (sores, rash) on the skin, it may cause to deteriorate. ● When or rash, irritation felt, I would recommend that you discontinue use, consult a specialist staff such as skin. You may continue to use and deterioration. ● If there is an abnormality in the skin, if your skin does not fit, please discontinue use.